Leading advertising, branding and digital marketing agency Austin & Williams today unveiled a series of creative video ads titled “Silent Heroes” that it created for Ocean Financial Federal Credit Union as part of an extended rebranding campaign that commenced in January 2017. The spots, which have been produced in 30-second and 60-second versions, celebrate the values of the Ocean Financial community, by presenting fictitious characters in familiar situations who step forward to make a difference in the lives of the people around them. 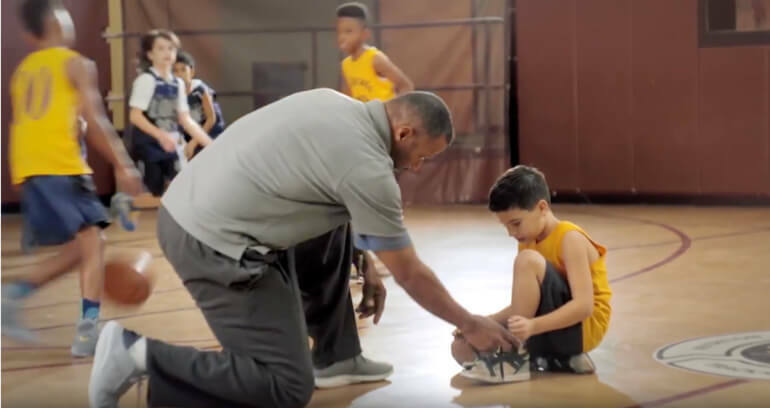 In the first spot, titled “Hoops With a Heart,” the coach of a basketball team of elementary school aged children notices one of his players is wearing sneakers that are old and ragged. He takes it upon himself to visit the sporting goods store, where he purchases a new pair of sneakers with an Ocean Financial-branded credit card, and surprises the boy by placing the sneakers in his gym locker before a game. The spot ends with the smiling boy joining his teammates on the court wearing the new sneakers. In the second spot, titled “Cooking for Good,” a volunteer at a community soup kitchen sees the critically important commercial stove give out, stopping meal service to the people who depend on the generosity of the center for food. The volunteer visits her local Ocean Financial branch to secure a loan to purchase an upgraded replacement stove to serve the needy people who depend on the facility for a daily meal. Both spots end with the voiceover, “Isn’t It Time We All Spread the Love?” which is based on a research-defined brand truth for OFFCU that centers on the nonprofit financial institution’s Catholic values, which drive a deep respect for the people and community it serves. The ads will run on Cablevision and vViamedia on Long Island during primetime network programming including A&E, AMC, HGTV and CNN. The ads were also published as online pre-roll served to targeted geographic and demographic audiences. The ads are also viewable here. Ocean Financial, headquartered in Oceanside, NY, provides exceptional financial products and services to the Catholic community. With branches in Oceanside and Seaford, Ocean Financial was chartered in 1969 by a small group of members at the Father Joseph O’Connell Knights of Columbus (Council #3481), and today is the fourth-largest Catholic credit union in the country, with more than 14,000 members and $314 million in assets.